The Portland edition of the Fresh Hop Tastival is this Saturday at Oaks Park. Despite its goofy name -- can we call it a "Wastival" next year? 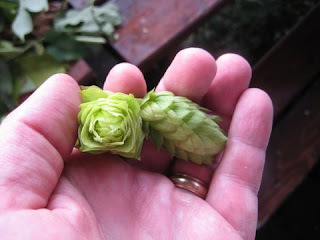 -- I'm really looking forward to it, a frenzied climax to the fresh-hop season. To get you even more excited, the OBG has published the tentative list for the Portland fest. Last year's festival in the small Hopworks parking lot was way too crowded. Holding it at Oaks Park is a great idea -- a pleasant bike ride down the Springwater Corridor and you're there. There's another excellent beer event Saturday night: Brewpublic's first anniversary party at Bailey's Taproom. Angelo has lined up a bunch of possibly once-in-a-lifetime beers -- including six fresh-hop ales -- so pace yourself at Oaks Park and save some room for Bailey's. Not one of those is a bad beer. I suspect that the specialness of doing a fresh-hop beer means that extra care is taken with these batches, which raises the quality level. Still, with such an embarrasment of riches, I can get a little picky, and say that Hop Trip and all the beers above it on the list are the beers that show the most fresh-hop character. The beers at the very top of the list are highly recommended: make every effort to try them before they're gone. What, no Roots? I guess I'll have to stumble down to the pub to check out this year's Hoppopotamus. And a couple years ago Mt. Hood Brewing brought a reasonable fresh-hop ale to the Tastival; I wonder why they've dropped out. Hopworks and Double Mountain have a couple more fresh-hop brews -- Crystal Method Pale and Fresh Vienna -- up their sleeve. I hope I have enough stamina to get to those also. Are there any good fresh-hop beers out there I missed? Anything that really grabbed your attention? Wow Bill, that is a list! I am definitely excited for the Tastival on 10/17. Unfortunately, it will probably be the only time most of these fresh hop beers make it down to Eugene. Save for Hop Trip and Sierra Nevada Harvest Ale bottles being available at the market, there hasn't been a lot of love for fresh hop beers at the local pubs. How was the CDA from Oakshire? I've been looking forward to it since their brewmaster Matt mentioned it in the survey he filled out for my site last month. I am also looking forward to finally getting a chance to try Laurelwood's Hop Bale and the fresh hop Mirror Pond. I have been hearing great things about both. Oakshire's CDA goes into a class of beers that I call "unnecessary use of fresh hops". Meaning, a delicious beer, that would be exactly as good without the wet hops. Some other examples: Hopworks Fest of Fury, Lompoc Harvest Man, Beer Valley's fresh-hop brews, past years' Bridgeport Hop Harvest. I'm tempted to put Double Mountain Killer Green and Laurelwood Organic Goodness into that category, because they're so big and good already that they might get by without the fresh hops, but they're so good that I don't want to jinx them. Don't miss the fresh-hopped Mirror Pond. It's a beer you'll remember for years.